Former State President and CCP General Secretary (retired 2012/13). May continue to have a say in Tibet Work. Imposed martial law when Party Secretary of the TAR in 1988. Career: 1988 Party Secretary of TAR, appointed to Politburo Standing Committee in 1992. Heads China Youth League “faction”. General Secretary of CPC 2002 – 2012, President of China 2003 – 2013. Prospects: Retired, but likely to retain an influence on policy and future promotions of China’s leaders. Relevance to Tibet: Had strong control of Tibet Work. Party Secretary of TAR 1988 – 1992 (during the imposition of martial law). Early recognition and support by Party elders including Hu Yaobang, Deng Xiaoping and Song Ping. First postings to Gansu and Guizhou provinces and Tibet Autonomous Region (December 1988 – 1992). Meteoric rise thereafter. Appointed to Politburo Standing Committee in 1992. Headed Central Party School and became Vice President, thus has been at top levels of China’s leadership from 1992 to 2012/13. In March 2003 the legislature elected him president by a vote of 2,937 to 4 with 3 abstentions. Hu did not succeed Jiang Zemin as Chairman of the Central Military Commissions until 2004/5, after generals expressed concern for Jiang’s attempts to cling to power. A Reuters report on 31 August 2012 correctly predicted that Hu planned a clean handover to Xi Jinping of the party leadership, the presidency and the chair of the central military commission over the period end 2012/early 2013, to avoid a repeat of what happened in the transition of power from Jiang Zemin. Reuters further reported that Hu had been (unsuccessfully as it transpires) negotiating to promote Li Keqiang to be a vice Chairman of the central military commission, in order that he might retain influence after stepping aside. One of Hu’s assignments in the Politburo Standing Committee was ethnic and minority affairs (according to Willy Lam). Known both for his ability to bring about compromise and his ability to keep his own views hidden. Reports about his family status are inconsistent – are most probably modestly well-to-do tea merchants. They are believed to have “strong Buddhist leanings.” (David Aikman, Time, to the Congressional-Executive Commission on China). Hu’s father was tortured then imprisoned during Cultural Revolution for capitalist crimes; died young as a result. Hu tried, without apparent success, to clear his father’s record. According to Richard McGregor’s book “The Party”, Hu’s elderly aunt who had raised him from the age of five, was prevented by officials from giving interviews to the media after Hu was named Party Secretary, and photos of him as a child were removed from her house, so that the Party could entirely control the narrative of his life. At Qinghua University, Hu was a member of the dance team and was reported to be good at the fox trot. Has a photographic memory. Fascinating personal details that were expunged from his official biography when he became leader-in-waiting included the comments such as “he plays table tennis fairly well” and “occasionally danced solo at parties”. Hu is credited with implementing the policy he called “grasping with both hands” (still visible in Tibet today), of combining economic development with a crackdown on separatism. (Hu Yaobang had advocated economic development, but Hu framed it as a crictical part in the fight against separatism). 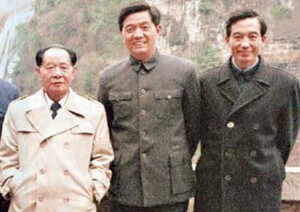 Above: Hu Yaobang, Hu Jintao and Wen Jiabao in 1986. At each Chinese new year, Hu Jintao travels…. to the dusty, un-renovated courtyard house of his deceased mentor, Hu Yaobang. “Hu Jintao sits here. I sit there next to mum,” says Hu Yaobang’s second son, Hu Dehua, gesturing to a line of chairs below a huge portrait of his diminutive father, dangling a cigarette. At first glance the current and former Communist Party chiefs have little in common beyond the coincidence of their family names and career paths. Hu Jintao comes across as every bit as stiff, impenetrable and conservative as Hu Yaobang was irrepressible, engaging and unapologetically liberal. (John Garnaut, Sydney Morning Herald, 29 May 2010). This entry was posted in Profiles and tagged Central Military Commission, China, Chinese Communist Party, Dalai Lama, General Secretary, hu jintao, Martial Law, Politburo Standing Committee, President, Tibet, Tibet Autonomous Region, Tibet Work Leading Group. Bookmark the permalink. ‘True Democracy’ Within China’s Politburo? “Can one find democracy in China? According to a US source in Beijing, the country’s Politburo is more interested in consensus than decrees — on all issues except for Tibet.” But consensus “doesn’t apply to one particularly touchy issue: that of the Dalai Lama and Tibet. On that subject, China’s president and Communist party head Hu Jintao ‘is firmly in charge.’ In his eyes, the Dalai Lama is a traitor and a separatist. Rebels are to be severely punished or re-educated — a view that Hu himself applied during his time as Communist party chief in Tibet from 1988 to 1992. Those who would prefer a milder approach risk their careers, US diplomats have been told.” Speigel Online, 5 December 2010. http://www.spiegel.de/international/world/0,1518,732963,00.html. July 2011: the rumoured death of former President Jiang Zemin is significant for the 2012 leadership transition. Jiang’s opinions would have a significant impact on decisions about the 5th generation leadership; if he is dead, Hu’s influence over who is to take the top jobs will substantially increase.